The naked handclaps of Clapping Music, a piece for two pairs of hands clapping out gradually phasing homorhythms, are a stark sound to come out of one's radio speakers. This starkness must have been especially present in the cavernous Royal Albert Hall, an institution that appears right now as something like Versailles in 1789. 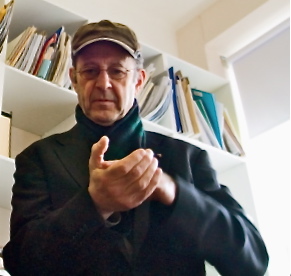 I previously witnessed a Steve Reich performance of Clapping Music in person, and it was an exciting occasion. Tonight, even with subtle amplification and competent enough rhythms from Reich and Rainer Romer, the piece fell a little flat. Not so Electric Counterpoint, Reich's mid-1980s tour de force. The piece was originally written for guitarist Pat Metheny playing against 12 recordings of himself, and it was performed tonight with grace and tenderness by Mats Bergstrom. Electric Counterpoint crosshatches cyclical African harmonic and rhythmic layering with gradual and dramatic Western presentation, forms, and climaxes, and tops these off with an Afro-Caribbean, but Western-derived, template of guitar timbres. The piece has a languor and a poise (particularly in the slow middle movement), even a classicism - in addition to a vividness of gesture - which raises it above much of the rest of the composer's work, and these qualities were conveyed very well in Bergstrom's performance. Reich's never-to-be-equalled (by him) Music For 18 Musicians apotheosises the phasing and collage techniques pioneered in such earlier works as Drumming, develops the composer’s timbral palette explored earlier in Music for Mallet Instruments and Drumming, and introduces a new harmonic teleology (the whole piece is based on a stretching and contracting cycle of 11 chords) that was previously absent from the composer's music. Above all, with its incessant pulsing, its staccatissimo voices rushing in and out, and its lissom and yet conductor-less progress through different timbres and grids of material, it is an exciting work that succeeds like no other to resolve Reich's own original conceptions of music, the expectation of the audience, and the conventional musical language of its time. There are no better performers of the piece than Ensemble Modern and Synergy Vocals, veterans and authorities after years of service. And so it was to prove tonight, with each outlay and overlay of material sounding freshly minted, unaware of itself, curious. The rhetoric of the piece is authoritative enough (without being imperious) to convey a sort of charged taking-stock of music itself circa-1976, sounding even today as a high-water mark of minimalism that recalls earlier gestures (such as the maracas of Organ Music or the wood block of In C) in a sort of summatory resolution. Yet the performers kept this impression just in their sidelong glance, preferring instead to highlight the newborn aspects of musical language that are inscribed in Music for 18 Musicians. The overall sound was vivid here, or at least it was in the comfort of my kitchen; my only major regret in relation to this Prom - albeit a regret that is mitigated by the hard facts of material reality - is that I didn't get to witness it in person. One of the exciting elements of Reich’s music is that one gets to witness through it extraordinary balancing acts and acts of endurance and accuracy by the performers, and as such, it usually provides an especially rich feast for both the eyes and ears. Even just to the ears, however, at least in the latter two pieces on this impressive (though such a conventional celebration of a hugely popular composer in his 75th year shouldn't be so) programme, the music felt vibrant and full of beauty.